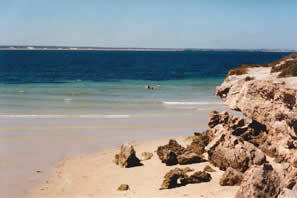 Willyama Beach at the south end of Marion Bay. It is secluded, private and picturesque. Stroll through the historic town of Inneston or bushwalk along the coast to observe the kangaroos, emu's, birdlife and flora. Dive the nearby reefs to explore the vast marine life and ocean wrecks. Stenhouse Bay is only 6 km from Marion Bay. The jetty was originally used to load gypsum from a nearby mine at Inneston, and it now makes an excellent picnic and fishing spot. It is renowned for catching squid. 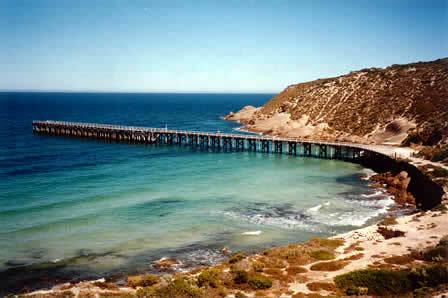 Boat fishing around the peninsula is recommended for good catches of King George Whiting, Red and Pink Snapper. 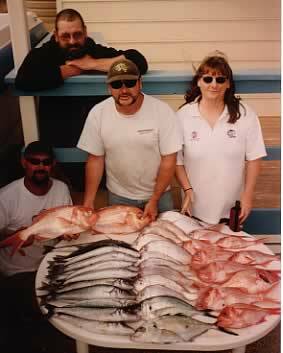 Pictured on the right are guests at Yorkes with a great day's catch! Bring plenty of ice and a huge cooler! Beach fishing for Salmon, Mullet and Mulloway is always good fun! A great safe swimming beach with wonderful views only 250 metres from Yorke's Holiday Units. A view overlooking Chinaman's Hat, the island on the left, and Cape Spencer in the distance. For surfers, Pondalowie Bay and Chinaman's have some of the best breaks in the state. Chinaman's is only 10 minutes drive from Yorke's Holiday Units. There is something for everyone at Yorke's ! Click here to request more information or to make a reservation.